David Krut Projects (DKP) is pleased to present a Survey of Risk by Matthew Hindley. 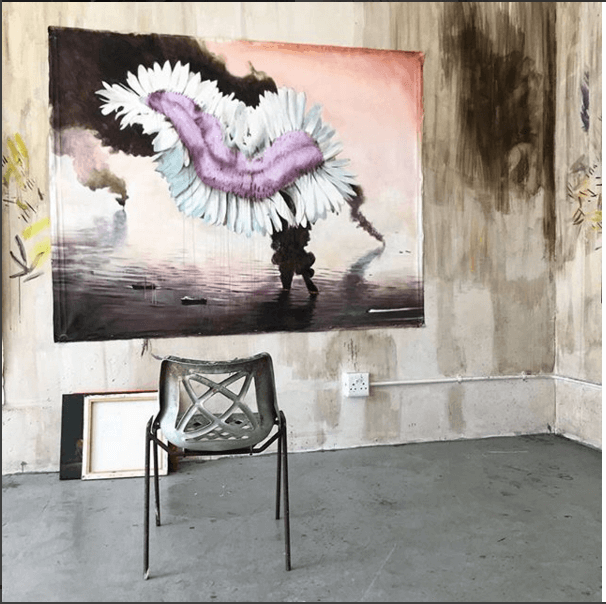 This exhibition is a review of the various processes Cape Town based artist Matthew Hindley has explored in his career. The manifestations of Hindley’s artistic risks – and their rewards – will be on display in the form of prints, drawings and paintings. Inspired by his collaboration with David Krut Workshop, Hindley’s time printmaking allowed for a creative intersection of mediums and processes, resulting in an interesting body of work. The works all deal with themes of destructive beauty and the incongruent nature of reality, featuring his 2016 prints from the series Ruin Lust (above), alongside new paintings and process drawings. Hindley draws on a variety of low-resolution photographic images as references for his work, expanding on the fantastic painterly qualities of the imperfect image through his visual language.The collaboration allowed for a fresh approach to painting, with his more recent paintings including decisive dry-point-style mark making. Hindley has also translated the layering methods from monotype printmaking, into his later works. The collaboration between Hindley and DKW has manifested into something unexpected. Printmaking has undoubtedly influenced Hindley as a painter, resulting in the unique progression of works in this exhibition, Survey of Risk.